Add the chopped onions and fry them till they turn golden brown. Next, add the ginger, garlic and green chillies and fry for 3-5 mins. Add the chopped tomatoes and fry well till the oil starts separating. Add 2 cups of warm water, cover and cook for 15-20 mins till the mince gets cooked. Add the peas and cook till they are tender and the mince is dry. Garnish with coriander and serve hot with roti/ puri/ paratha/naan. Note : Since I like chunkier mince, therefore, I have used homemade mince which is not so fine as the mince which one gets in the store. 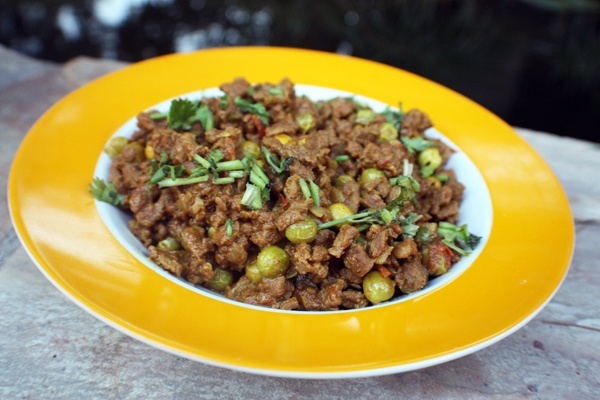 This entry was posted in All Recipes, Chicken, Mutton and tagged Keema Mata Curry, Mince and Pea curry by Kamakshi. Bookmark the permalink.